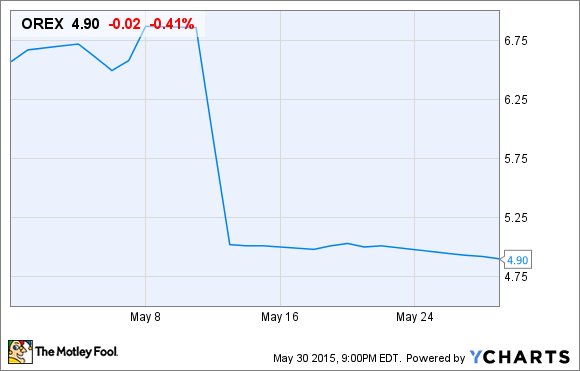 Orexigen Therapeutics' shares, not its patients, slimmed down in May. Find out what made Orexigen one of healthcare's worst-performing stocks last month and whether a rebound could be in the cards. What: Shares of Orexigen Therapeutics (NASDAQ:OREX), a small-cap drug developer focused on treating obesity, slimmed down and lost 25% of its value in May, based on data from S&P Capital IQ, after announcing bad news regarding its long-term cardiovascular outcomes study. So what: As a quick refresher, in March Orexigen announced interim results from its Light Study, which is designed to test the safety of its drug Contrave on patients' hearts over the long-term. Orexigen's announcement suggested that taking Contrave actually resulted in a cardiovascular benefit for patients. However, per the Food and Drug Administration, the data set Orexigen was basing its info off of was just the first 25% of patients, and the regulatory body was none too pleased with Orexigen's loose lips on data that never should have been made public. In fact, the next 25% of patients demonstrated no cardiovascular benefit from taking Contrave. In May, the FDA informed Orexigen that its announcement prior to the completion of the study may result in biases that can't be removed or discounted from the study. In other words, Orexigen is going to have to shelve its long-term Light Study and begin all over again. The new study is expected to begin later this year and will not be completed until 2022. Furthermore, Contrave's licensing partner, Takeda Pharmaceuticals, is having pricing "issues" with Orexigen that could cause it to walk away from its collaboration. Specifically, Takeda wants Orexigen to bear the full cost of the next cardiovascular outcomes study, and as you might expect, Orexigen doesn't want to do that. Now what: It's actually amazing how quickly Orexigen Therapeutics went from hero to absolute goat. It's still possible that even without the Light Study, Contrave can outperform its peers, but it definitely removes the "one up" aspect that the Light Study provided for Orexigen. However, what this does mean for Orexigen are added expenses (especially if Takeda decides to walk away from its collaborative agreement) and tougher competition since it doesn't have the Light Study data to make its case on. What investors need to do is see how consumers and physicians react to this news. Over the last two years sales of weight control management drugs can best be described as disappointing. Contrave's first quarter on pharmacy shelves looked promising, but that was before the FDA walloped Orexigen and its partner Takeda. My suggestion would be to approach this stock with cautious optimism. We know weight control drugs aren't selling well, so I'd probably wait until we get some sales momentum behind Contrave before considering buying shares of Orexigen. However, even without the Light Study, Contrave could still prove successful, and Orexigen may turn out to be a bargain here. Overall, I believe investors have the time to hang out on the sidelines and wait for this sales data to materialize, as Orexigen's share price probably isn't going to ascend to the heavens overnight.